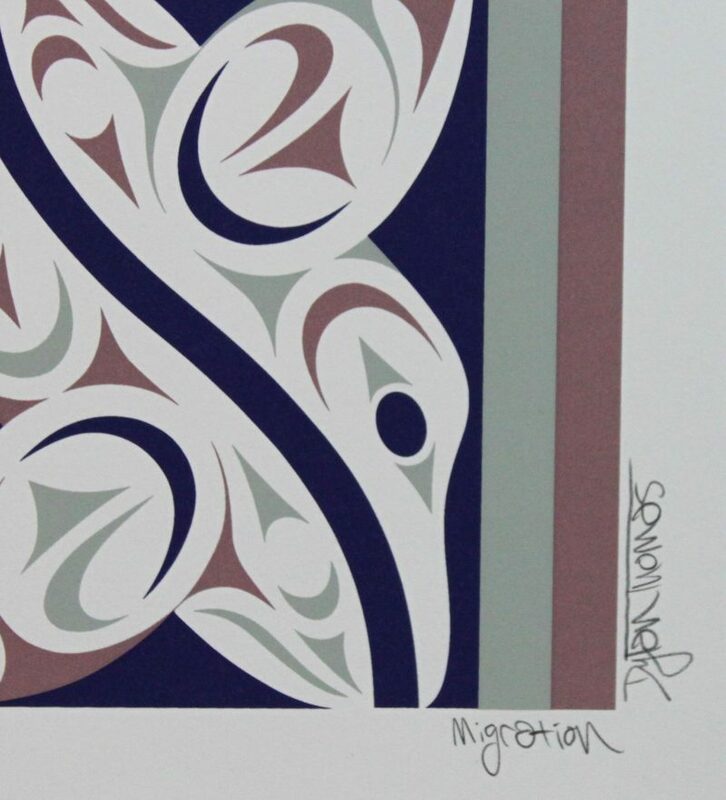 "On the Northwest Coast, eagles, thunderbirds, and ravens were the birds of choice in traditional indigenous art – but as the art has evolved into its contemporary form, the hummingbird has joined the major motifs in the Coast’s artistic lexicon. I am not surprised that the hummingbird has gained significance; their iridescent feathers and sleek body shape give them a majesty and extravagance that is only matched by exotic birds such as the peacock or the parrot. And it seems that the more one learns about the hummingbird, the more fascinating they become: they are the only type of bird that can hover in the air, they can flap their wings up to 70 times per second, their heart can beat up to 250 times per minute, and for such a tiny bird, some species travel incredible distances in their yearly migration. The Rufous Hummingbird (one of the species that are found on Vancouver Island), despite being only 7-9 centimeters long, actually has an annual migration spanning up to 3200 kilometers – flying from Mexico all the way to Alaska. So despite being absent from traditional Salish artifacts, I think hummingbirds have earned their spot in contemporary art by inspiring awe in so many people. This print pays tribute to the many fascinating and beautiful breeds of hummingbirds found across the Americas." This limited edition silkscreen print titled "Migration" by Dylan Thomas was hand produced by the screen printing process. It is the only limited edition printing of this design. The artist has inspected and signed each copy in the edition. All trial copies of this edition have been destroyed and the printing stencils obliterated.